The steady and unabated increase in the capacity of silicon has brought the semiconductor industry to a watershed challenge. Now a single chip can integrate a radio transceiver, a network interface, multimedia functions, all the "glue" needed to hold it together as well as a design that allows the hardware and software to be reconfigured for future applications. Such complex heterogeneous systems demand a different design methodology. A consortium of industrial and government labs have created a new language and a new design methodology to support this effort. Rosetta permits designers to specify requirements and constraints independent of their low level implementation and to integrate the designs of domains as distinct as digital and analog electronics, and the mechanical, optical, fluidic and thermal subsystems with which they interact. 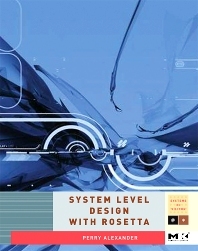 In this book, Perry Alexander, one of the developers of Rosetta, provides a tutorial introduction to the language and the system-level design methodology it was designed to support.